The pool deck is more than just a slab of concrete out in your backyard. It requires more recognition than that. Think of it as the showplace for your swimming pool. You and your guests would be able to lounge on outdoor furniture, walk around the pool, and even have parties on the pool deck. Having a concrete pool deck does not make it any less important than one made of high-end paving materials. However, when the surface is cracked and dirty, it can be quite embarrassing to have people even see it, right? Good thing there is decorative concrete. Updating the pool deck is a lot easier now than before. In the past, if you want to make the pool deck better, you would have to tear out the old one and replace it with a new pour. That process was expensive and time-consuming. Now, there are options you could choose from to acquire an updated look and improved function using the pool deck you currently have. Pool Deck Resurfacing – Resurfacing is a lot more practical than replacing the entire slab. With just an additional material at the top, the form and function of the pool deck are renewed easily and at an affordable cost. Pool Deck Refinishing – Refinishing is the process of changing the finish of a concrete pool deck as a means of renewing its aesthetics. Staining the surface gives the deck a whole new look. Resealing it renews the extra protection that the slab has and adds a bit of shine to it as well. Pool Deck Repair – Most cracks, holes, and other damage are easily repaired. Pool decks are always exposed to harmful elements, be it the chemicals in the pool water, weather changes, or heavy foot traffic on the deck. No matter what the cause, it is advisable to have a pro take a look. This will help determine if the damage is repairable or if a new deck needs to be installed. There is no doubt that concrete is a durable material. It is the reason why it is still a popular material up to today. Although it is often just used as a sub-base, decorative concrete made it possible to make it look more aesthetically pleasing. Good enough to make you want to use it from base to the top. Coatings and overlays can be used as an alternative to paving materials like tile, brick, or stone. Stamped Concrete Overlay – Stamping is one of the trending methods nowadays to acquiring a highly decorative pool deck. The process involves imprinting a pattern on a concrete overlay. The patterns can range from geometric to nature-like. 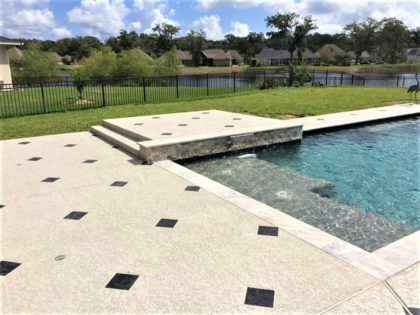 A stamped concrete pool deck is an affordable alternative to installing stones, bricks, and other expensive paving materials. Manual staining can make the imitation a lot more effective. Spray Knockdown Texture – This spray-down material became popular in resurfacing a concrete pool deck because of the slip resistance surface it provides. Another notable feature is its ability to maintain a low temperature. No matter how long it sits under the sun, it remains cool to the feet. Stained Concrete – Staining a pool deck not only enhances an otherwise utilitarian pool deck, it also covers up ugly stains and even the natural discoloration that concrete undergoes. Call (720) 545-1766 to Hear from One of Our Pool Deck Professionals Today! When it comes to concrete pool decks, we understand that property owners have their own ideas and we make sure that we work hard to make it a reality. The goal of Denver Concrete Artisans is to provide you the dream pool deck that you desire and deserve. Our team of installers goes the extra mile in taking care of your deck and making it more valuable than it already is. Want to know more? Request an in-home visit from one of our experts! Call now!